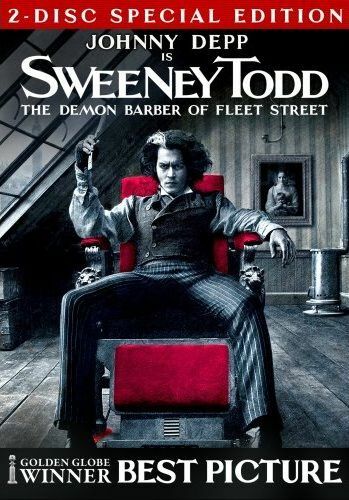 Sweeney Todd - The Demon Barber of Fleet Street is a movie about a barber and his woman who kill people, bake them into meat pies, and sell them to the rest of the town... sure as heck sounds like a freakin' sweet horror flick that I'd enjoy! Unfortunately, it wasn't. Anyone who knows me also knows about my stance on musicals, which is basically that, if the singing doesn't feel like a natural part of the movie, then I tend to not like them. And in this film, the singing doesn't feel like it's a natural part of the story. It feels as if they're singing because they need to fill time. Like this story could have easily been told in an hour-long special for television had they just removed the musical numbers. Still, this is different from most musicals I've seen, and I'm not just referring to the whole horror thing. In the film, the characters will often time sing their lines, even when they're not in a musical number (or setting one up). Yes, this is a musical AND a horror flick, and it doesn't skimp on the blood like one might expect. It's bright red and it sprays freely, though the horror scenes themselves really aren't that graphic... at least, I've seen way, WAY more graphic scenes. Compared to my favorite of the slasher series, Friday the 13th, they deaths are rather simplistic, such as seeing a razor driven across a man's throat. Though I must admit, those shining silver razors were pretty cool looking, and the way Sweeney looked holding on to them made him seem like he could stand with even the best of slashers. All the characters actually looked pretty cool, as were the sets and overall ambiance. I think it had a really great sense of style, and I was also impressed with how good the actors sang, considering they were actors and not professional singers. No voice doubles here! Unfortunately, what brought the movie down for me was the singing and the simple and rather predictable plot. Sometimes musical numbers work great in a story, such as Moulin Rouge, Hairspray, and Chorus Line, where they flow naturally and seem perfectly logical, but I just didn't get that feeling from this film, even though it's based off of a Broadway musical. And the story was much too simple and predictable. From the moment Sweeney meets Mrs. Lovett, I figured she would get in on the killing with him. From the moment when Anthony (an acquantence of Sweeney) sees Johanna (Sweeney's daughter), I figured that he would rescue her. And when the "old woman" first appeared to tell Anthony Johanna's name, I had a pretty good guess of who she would turn out to be, and what would eventually end up happening to her. Now, I know I don't like it when I can't follow what's going on in a film, but I also don't like it when I can have the entire thing figured out before the first act is even over. Sweeney Todd - The Demon Barber of Fleet Street , released by Dreamworks, is available starting April 1, 2008.